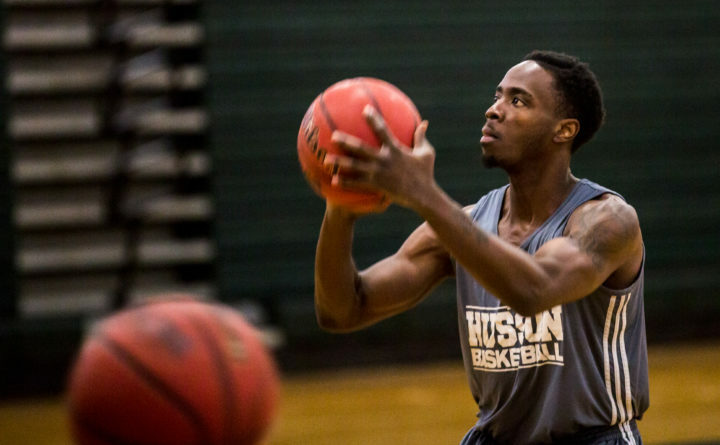 Husson University senior Raheem Anderson, originally from Florida, practices in the Newman Gym at Husson University in Bangor. Cole Thomas knows little about the southern migration that sends retirees from Maine away to escape Mother Nature’s winter wrath or pushes younger adults toward the Northeast’s larger cities in search of jobs to match their educational pursuits. The 6-foot-5 freshman guard from Orlando, Fla., just wants to play college basketball so he’s embarked on a rather rare northern migration — to Husson University in Bangor. “I knew I was going to go far away for college, and to be honest that really didn’t bother me because I wanted some new experiences and to live in a new place because I had lived in Florida my whole life,” said Thomas. Thomas is one of approximately 20 Florida natives on Maine small-college men’s basketball rosters this season. They are recruits who might otherwise have had difficulty finding a place to play the sport after high school because Florida has no NCAA Division III athletic programs within its borders. Recruiting in Florida and other areas of the country such as Texas, California, Colorado and Arizona with few if any Division III schools is becoming more common among coaches from the Division III-heavy Northeast, including Maine. Thomas College of Waterville numbers eight Florida natives on its roster while Husson has four Floridians and the University of Maine at Presque Isle, the University of Southern Maine of Gorham and the University of Maine at Machias each boasts two Florida-born players. Perhaps best known of the basketball “sunbirds” is Husson senior Raheem Anderson of Miramar, Fla., who recently surpassed 2,000 career points and was the North Atlantic Conference and ECAC Division III player of the year after leading the Eagles to the NCAA Division III tournament last winter. Florida has 13 NCAA Division I schools and 13 NCAA Division II programs, all offering athletic scholarships. But the Sunshine State has no schools in Division III, a nonscholarship level with hotbeds in the Northeast and Midwest. “There’s a lot of talented high school players down there who want to play at the next level, but a lot won’t earn Division I or Division II scholarships so you have some very good players who might fall through the cracks,” said Hensley. Thomas flirted with that possibility as he weighed his college options, including one Division II scholarship offer early in his senior year of high school that he turned down. “As the season progressed I really thought I would pick up more Division II offers and there was a lot of interest, but as the clock started ticking and more scholarships were given out, I didn’t honestly put up the numbers I needed to my senior year to get a lot of attention from Division II schools,” he said. That eventually led Thomas, who was aided by an Orlando basketball enthusiast who sent out basketball-related information about him to Division III schools around the country, to Husson’s New England School of Communications. The northern climate that drives many Mainers south is not often a deterrent for Florida teens looking to extend their basketball careers. For Division III coaches, recruiting is both high-tech and old school. That’s typically followed by more traditional recruiting work such as contacting personal connections and scouting players at AAU tournaments or recruiting showcases. The aim of recruiting is to develop a successful program, blending players with complementary skills and students from diverse backgrounds into a cohesive team capable of achieving unified success. “At the end of the day we’d like our roster to be representative of the student body at the university,” said Caruso. “We generally look to identify the top three to five student-athletes in Maine that we think we can recruit and would have an interest in coming to Husson University. The need to recruit outside Maine stems in part from the competition for the state’s top talent. And if a Florida connection is part of that equation, coaches and players alike generally are fine with that. “Everyone in Florida thinks when they’re a freshman or sophomore that they’re going Division I,” said Thomas. “Then when they’re a junior they think they’re going Division II.